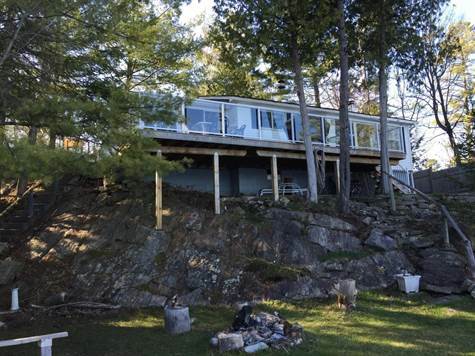 Bedrooms: 2 "and Bunkie makes 3"
Turn-Key 4 Season cottage beautifully updated. Bright eat-in kitchen, living room w/ vaulted ceilings and wett certified stone fireplace. Large sunroom w/ walk-out to oversized deck overlooking granite outcroppings, treed & landscaped lot, lake views, wet-slip boathouse and firepit. Updated bath. Finished Bunkie for weekend guests. Forced air propane heating. Includes most furnishings and contents !! 3rd Bedroom (10'x10') is located in Bunkie.